If you haven’t seen my last book post of the books I read during the first half of 2017 then make sure you check that out. I’ve been trying so hard to step away from the computer more, especially in the evenings and weekends. I have found reading helps relax my mind and stops me clicking on the internet and filling my time reading endless social media posts. I read not shy of 20 books during 2017 and I thought I would share the latest 8 with you. I don’t know why but I love reading books that are set in Russia and The Amber Keeper is partly set in early 19th century revolutionary Russia. It is also set in another of my favourite locations, the English Lake District. The Amber Keeper is a sweeping tale of jealousy and revenge, reconciliation and forgiveness. Determined to uncover her mother’s past, Abbie approaches her beloved grandmother, Millie, in search of answers. As the old woman recounts her own past, Abbie is transported back to the grandeur of the Russian Empire in 1911 with tales of her grandmother’s life as a governess and the revolution that exploded around her. At times I found this book a little slow, I loved the parts that were set in Russia, I found them exciting and very descriptive but when it came to the more recent parts set in rural England they were quite dull and not as engaging. This is such a heartbreaking, eye-opening memoir written very candidly about a family living with the crippling effects of mental illness. It is so deeply sad at times but it is also moving and ultimately a love story. Mental illness is not such a taboo subject anymore and the way Mark & his wife let us into the very harrowing and fragile parts of their experience with living with mental illness makes this a very powerful book. I loved, loved, loved this book. It is a peek inside Scotlands second largest secondhand bookshop. You’re a fly on the wall to all the goings on and the people that come and go (often empty-handed) Shaun is so dry humoured and has the best (often unexpected) responses to his customers and their outlandish requests and observations. We get to see just how hard it is selling secondhand books in the days of eBay and Amazon. You get to know the bookshop staff and I loved seeing what books people bought and also going along with Shaun on his buying trips to old estates and auction houses. This is such a lovely read & I highly recommend adding it to your reading list. This wasn’t a page turner for me, even though there were quite a few plot twists, in fact, I found it disjointed and I just wanted to get it finished so I could move on to something else. It is somewhat of a detective story in the midst of a crime that brings up a lot of buried family drama which comes full circle. Cat is quite annoying and I found myself not believing in her character. ‘Cat Kinsella was always a daddy’s girl. Until the summer of 1998 when she sees her father flirting with seventeen-year-old Maryanne Doyle.When Maryanne later disappears and Cat’s father denies ever knowing her, Cat’s relationship with him is changed forever. Another book which is set in WWII Europe but told from a Jewish woman’s perspective. This book follows Rita as she struggles to survive in Nazi-occupied Poland and then in Germany, under a false identity. I read this within a week and was gripped from beginning to end. In an epic saga that spans from Paris in the ’30s and Spain’s Civil War to Moscow, Warsaw, and the heart of Nazi Germany, The Girl from Krakow follows one woman’s battle for survival as entire nations are torn apart, never to be the same. Who doesn’t dream of packing it all in & running off to Europe to live the ‘Good Life’?! I picked this book because the Mum of one of my very good friends has done exactly that, she has moved to France to live the rural dream and I thought this book might be an insight into what that entails. It is a true story following Janine’s unexpected journey from London to beautiful (at times) idyllic, rural France. It’s a funny, light-hearted read and Janine opens up her life to us, the reader and you get find yourself completely absorbed with her highs and lows. It is a lovely calming read and another book I’d urge you to add to your reading list. I’d heard mixed things about this book & I have to say I found it underwhelming. I just couldn’t seem to get into it. There were parts that were utterly heartbreaking and brutal but on the whole, it wasn’t as well written as I’d hoped. Not my favourite read of 2017 but I do know a lot of people that thoroughly enjoyed it. I read a real mixed bag of books during the second half of 2017, books set in Russia, Italy and Poland. I reached mainly for fiction but a couple were non-fiction with one being a memoir that was a real eye-opener into a family dealing with the realities of mental health. I seem to be drawn to books set in Europe and that is very much reflected in the books I have already lined up to read in 2018, I just love books that are set with a European backdrop & I find them so interesting. 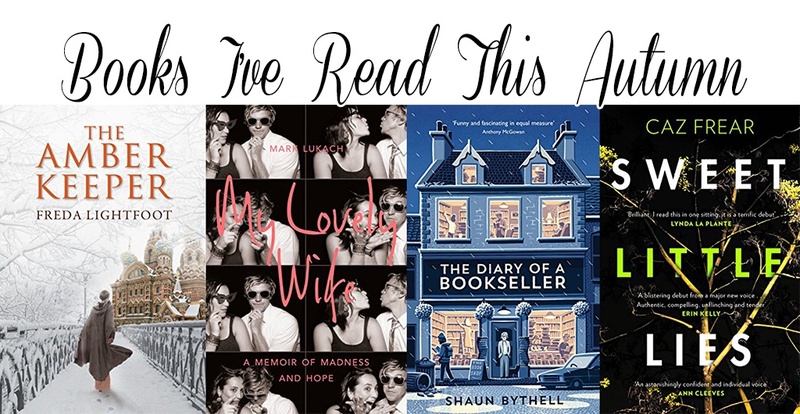 I was disappointed with a few books, namely The Underground Railroad but The Diary of a Bookseller and Beneath a Scarlet Sky more than made up for it. I was lucky enough to receive so many lovely books as gifts this Christmas and I am looking forward to getting stuck into those in 2018. I have set myself a goal of reading at least 2 books a month, which I think is achievable. If you want to follow me over on Goodreads – it is a great way to see keep up to date with what I’m reading. My husband bought me St Petersburg: Three Centuries of Murderous Desire which is top of my reading list and I think it will take me quite a while to get through. If you have any recommendations for books you read in 2017 leave them in the comments and we can all add them to our wishlists!